« The Stripper Strikes Again! First On A Fly Rod! Everything holding steady. Weather remains nice, although yesterday felt pretty hot during the middle of the day. Still have a chance for showers, possibly starting tonight, then into tomorrow. Temperatures still look reasonable for this time of the year…low to mid 90s. Yesterday’s generation was a surprise. The projection was for one generator to come on around 3:00 p.m. and stay on for a couple hours. The surprise came when they started it up at 11:00 a.m. and it stayed on until 7:00 p.m. And, instead of the equivalent of one generator, they turned on the equivalent of two. Just remember, those are only projections….subject to change. Otherwise though, they have been pretty accurate. Let’s see what happens today!! Clayton got his Christmas present yesterday. For Christmas, his grandmother, Loretta, gave Clayton an instructional fly fishing trip. Clayton has wanted to learn how to fly fish, so Loretta and he spent the morning with Gina. Gina worked with them on all the basics and said they were both managing their casts and drifts well. It was a tough day on the water, but Clayton came through with a few fish on the red San Juan worm. He had a pretty good grin on his face when he came into the shop and I asked him how he liked fly fishing. 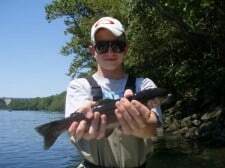 This entry was posted on Sunday, August 28th, 2011 at 9:11 am	and is filed under Fishing Reports. You can follow any responses to this entry through the RSS 2.0 feed. You can leave a response, or trackback from your own site.